Before I list those Aircrews drafted from 97 Squadron to 617 Squadron led by Wing Commander Guy Gibson, I am inserting the signature of the creator of the Bouncing Bomb, Barnes Wallis. I would like to thank John Cripps Webmaster of 198 Squadron for sending it to me. 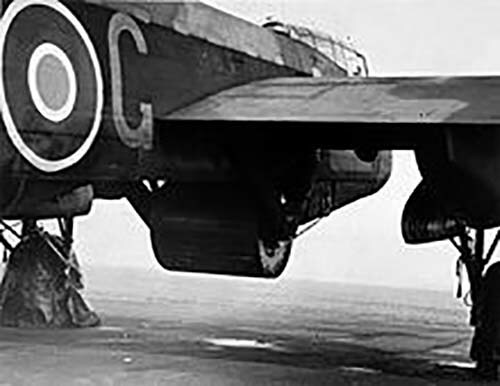 When 617 Squadron was formed, Aircrews from across BomberCommand were selected to take part. Not all those selected actually took part in the Dams Raid. Below is a list of Aircrews who were seconded to 617 from 97 Squadron. We have tried to follow up what happened to them afterwards. Some survived the War, others did not. Pilot: F/L Joseph Charles McCarthy – Born 1919 USA. Awarded DFC 14.5.43. DSO 18.5.43. Bar to DFC 28.4.44. Died 1998. Flight Engineer: Sgt William Radcliffe – Born Canada. Awarded DFC 28.5.44. Killed in car accident 1952 after his car went into a river. Navigator: F/Sgt Donald Arthur McLean – Born Canada. Awarded DFM 28.5.43. Retired as Wing Commander. Bomb Aimer: Sgt George Leonard Johnson – Born 1921 Horncastle, Lincs. Awarded DFM 28.5.44. Retired as Squadron Leader. Still alive. Wireless Op: F/Sgt Leonard Eaton – Awarded DFM 30.6.44. Died 1974. Front Gunner: Sgt Ronald Batson – Awarded DFM 23.5.44. Rear Gunner: F/O David Rodger – Born 1918 Canada. Awarded DFC 15.9.44. Died 1.9.2004 in Ontario. Pilot: F/L John Leslie Munro – Born 1919 New Zealand. Awarded DFC 11.6.43. DSO 28.4.44. Retired as Wing Commander. Still living in Te Kuiti in New Zealand where he was Mayor for several years. Flight Engineer: Sgt Frank Ernest Appleby - Awarded DFM 30.6.44. Navigator: F/O Francis Grant Rumbles – Awarded DFC 15.6.43. Bar to DFC 15.6.44. Died 1982. Bomb Aimer: Sgt James Henry Clay – awarded DFC 30.6.44. Wireless Op: W/O Percy Edgar Pigeon – Born 1917 Canada. Awarded DFC 30.6.44. Died 1967. Front Gunner: Sgt William Howarth – Awarded DFM 30.6.44. Died 1990. Rear Gunner: F/Sgt Henry Alexander Weeks – Awarded DFC 30.6.44. Pilot: F/L David John Maltby – Born 1920. Awarded DFC 11.8.42. DSO 18.5.43. Killed in action 15.9.43 aged 23. Buried Wickhambreux Church Yard, Kent. Flight Engineer: Sgt William Hatton – Born 1921 Wakefiled, Yorks. Killed in action 15.9.43, aged 23. Runnymede Memorial. Navigator: Sgt Vivian Nicholson – Born 1923. Awarded DFM 28.5.43. Killed in action 15.9.43. Runnymede Memorial. Bomb Aimer: P/O John Fort – Awarded DFC 28.5.43. Killed in action 15.9.43. Runnymede Memorial. Wireless Op: Sgt Anthony Joseph Stone – Born 1921 Winchester. Killed in action 15.9.43. Runnymede Memorial. Front Gunner: F/Sgt Victor Hill – Killed in action 15.9.43. (not previously 97 Squadron). Rear Gunner: Sgt Harold Thomas Simmonds – Born 1921 Burgess Hill, Sussex. Killed in action 15.9.43, aged 22. Runnymede Memorial. 21. 8/9 Jun 42 Essen. Flight Engineer (in ED912G): Sgt John Pulford. Born Hull. Awarded DFM 28.5.44. Killed in an accident 13.2.44, aged 24. Buried Hull Northern Cemetery. Rear Gunner (in ED912G): F/L Richard Dacre Trevor-Roper – Born 1915 West Bridgeford, Notts. Awarded DFM 23.10.42. DFC 28.5.43. Joined 97 Squadron 5.3.44. Killed in action 31.3.44, aged 28. Buried Durnbach War Cemetery. P/O G.E.Osborne and Sgt L.Williams did not take part in The Dams Raid.